The Southeast Asian countries have already secured a niche in the global market for their fish and fishery products, contributing about 14% to the world’s total exportation of fish and fishery products in 2015 in quantity and value, and a little less than 40% to the total exportation from Asia, also in terms of quantity and value. Viet Nam, Thailand and Indonesia had remained the Southeast Asian region’s highest exporters of fish and fishery products during the past five years or so. In fact, in 2014, Viet Nam and Thailand ranked as the world’s third and fourth highest exporters, respectively. The efforts made by the Southeast Asian countries to improve their respective fisheries management policies and regulations towards sustainability have greatly contributed to this success. Such initiatives also enabled the countries to comply with the requirements of importing countries. SEAFDEC will continue to assist the Southeast Asian countries in these endeavors in order that the growth of the region’s exportation of fish and fishery products would remain positive in the future. The information provided in this webpage is meant to keep the Southeast Asian countries abreast of the developments in the international trading arena of fish and fishery products, to be able to cope with the downsides that challenge the fisheries industry. Illegal, unreported, and unregulated (IUU) fishing is considered one of the greatest threats to the marine ecosystems due to its potent ability to undermine not only the national and regional efforts to manage fisheries sustainably but also all endeavors to conserve the marine biodiversity. With a view to combating IUU fishing, FAO developed the “International Plan of Action to Prevent, Deter and Eliminate Illegal, Unreported and Unregulated Fishing (IPOA-IUU),” which was adopted during the Twenty-fourth Session of COFI in March 2001, and was subsequently endorsed by the One Hundred-twentieth Session of the FAO Council in June 2001. Although a voluntary instrument, the IPOA-IUU applies to all States and entities as well as to all fishers, and provides the principles and the implementation measures to prevent, deter and eliminate IUU fishing that focus on the State responsibilities, flag State responsibilities, coastal State measures, port State measures, internationally agreed market-related measures, and on the corresponding roles of research and regional fisheries management organizations. In response to the need to combat IUU fishing and in line with the provisions stipulated in the IPOA-IUU, several Regional Fisheries Management Organizations (RFMOs) and countries importing fish and fishery products issued during the past decade, directives to ensure that products derived from IUU fishing could not be brought into the supply chain, e.g. the RFMOs’ catch documentation schemes, the Council Regulation (EC) No 1005/2008 of 29 September 2008 establishing a community system to prevent, deter and eliminate illegal, unreported and unregulated fishing; and the U.S. Presidential Task Force on Combating IUU Fishing and Seafood Fraud, among others. Port States Measures (PSM) is another initiative that aims to prevent, deter and eliminate IUU fishing. The Agreement on Port State Measures (PSMA), a first legally-binding instrument specifically targeted at combating IUU fishing by preventing vessels engaged in IUU fishing from using ports and landing their catches, reduces the incentives of such vessels to continue operating and blocks fishery products derived from IUU fishing from reaching national and international markets. Entered into force on 5 June 2016, the PSMA has been ratified by 56 States, of which five are SEAFDEC Members and are now Parties to the PSMA (as of 2018), namely: Indonesia, Japan, Myanmar, Philippines, and Thailand. 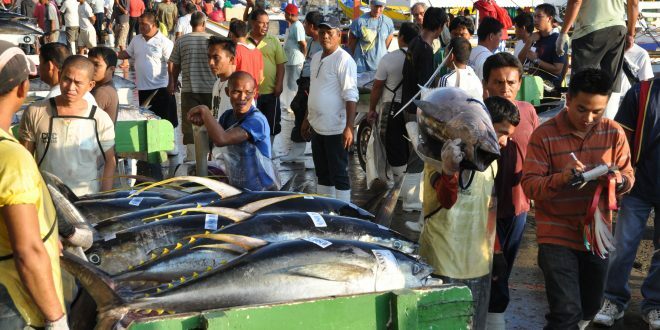 While promoting sustainable fisheries and developing measures for combating IUU fishing in Southeast Asia, SEAFDEC also compiles information on the trade of fish and fishery products from the Southeast Asian countries. The overall regional framework towards combating IUU fishing through the adoption of the “ASEAN Guidelines for Preventing the Entry of Fish and Fishery Products from IUU Fishing Activities into the Supply Chain,” had been recognized by the SEAFDEC Council and subsequently by the ASEAN Ministers in 2015. Parallel activities have been undertaken by SEAFDEC to come up with supportive tools, such as the database on Regional Fishing Vessels Record (RFVR) starting with vessels 24 meters in length and over that aims to facilitate the checking of fishing vessels registered under the ASEAN Member States (AMSs); and the ASEAN Catch Documentation Scheme (ACDS) that promotes the application of traceability system from catch to market or exportation. Furthermore, regional cooperation and capacity building activities have also been strengthened by SEAFDEC to support the implementation of Port State Measures, as well as the PSMA. Establishment of MCS networks among countries had been encouraged; and the Regional Plan of Action for Management of Fishing Capacity (RPOA-Capacity) was developed and endorsed by the ASEAN. The “High-level Consultation on Regional Cooperation in Sustainable Fisheries Development Towards the ASEAN Economic Community: Combating IUU Fishing and Enhancing the Competitiveness of ASEAN Fish and Fishery Products” organized by SEAFDEC in August 2016 came up with the “ASEAN-SEAFDEC Joint Declaration on Combating IUU Fishing and Enhancing the Competitiveness of ASEAN Fish and Fishery Products.” The adoption of the Joint Declaration by the representatives from the ASEAN-SEAFDEC Member Countries during the High-level Consultation, demonstrated the willingness of the AMSs to combat IUU fishing in their respective waters and enhance the competitiveness of their fish and fishery products bound for the world market. Furthermore, in response to the request over the years of the countries around the Gulf of Thailand and the Andaman Sea, SEAFDEC initiated bilateral dialogues between neighboring countries in these two sub-regions with a view to facilitate discussion and seek cooperation on fisheries-related issues including combating IUU fishing, and the possibility of establishing sub-regional network for monitoring, control and surveillance (MCS) with main emphasis on sharing of information on monitoring and control between countries. All of these are meant to support national efforts to mitigate IUU fishing activities in the Southeast Asian region as well as respond to the concerns of importing countries in Europe and the U.S., and certify the legal status of fish and fisheries products traded by the AMSs. The Convention on International Trade in Endangered Species of Wild Fauna and Flora (CITES), an international agreement among governments which was entered into force on 1 July 1975, ensures that the international trade in specimens of wild animals and plants does not threaten their survival. A set of criteria and guidelines had been developed to assist the evaluation of whether or not a species should be listed under different Appendices of CITES. Appendices I, II and III to the Convention are lists of species afforded different levels or types of protection from over-exploitation. Appendix I lists the species that are the most endangered among CITES-listed animals and plants. Threatened with extinction, specimens of these species are not allowed for international trade except when trading is not meant for commercial purpose, for instance for scientific research. In these exceptional cases, trade may take place provided it is authorized by the granting of both an import permit and an export permit (or re-export certificate). Appendix II lists the species that are not now necessarily threatened with extinction but that may become so unless trade is closely controlled. It also includes the so-called “look-alike species” for conservation reasons, i.e. species whose specimens being traded look like those of the species listed. International trade in specimens of Appendix II species may be authorized by the granting of an export permit or re-export certificate. No import permit is necessary for these species under CITES (although a permit is needed in some countries that have taken stricter measures than that required by CITES). Permits or certificates should only be granted if the relevant authorities are satisfied that certain conditions are met, above all that trade will not be detrimental to the survival of the species in the wild. Appendix III is a list of species included at the request of a Party that already regulates trade in the species and needs the cooperation of other countries to prevent unsustainable or illegal exploitation. International trade in specimens of species listed in this Appendix is allowed only on presentation of the appropriate permits or certificates. Species may be added to or removed from Appendix I and II, or moved between them, only by the Conference of the Parties, either at its regular meetings or by postal procedures. But species may be added to or removed from Appendix III at any time and by any Party unilaterally (although the Conference of the Parties has recommended that changes be timed to coincide with amendments to Appendices I and II). Upcoming discussion on proposals to amend the lists of species in Appendices I and II is during the CITES CoP18 scheduled to be organized on 23 May – 3 June 2019 in Colombo, Sri Lanka. The updates on the proposal for listing of species into the CITES Appendices could be checked at https://www.cites.org/eng/cop/index.php. The proposed listing of commercially exploited aquatic species (CEAS) into the CITES Appendices is one of the crucial issues that could impact not only on the management of fisheries but also on the economies of the countries in the region. Such impacts are anticipated not only as a result of regulation in trade of the species being listed into the CITES Appendices, but also in the trade of look-alike species, as well as trade in parts or processed forms of the species. The listing of species into the CITES Appendices could therefore result in the termination of data collection on the production of these species, leading to the unavailability of data and information on the status of the species after being listed. Furthermore, difficulties could also be encountered in proposing to delist or down-list the species once these are listed in the CITES Appendices. At the 32nd Meeting of the SEAFDEC Program Committee in 2000, SEAFDEC was asked to carefully give consideration on the proposed listing of CEAS into the Appendices of the CITES. In response, SEAFDEC has initiated the implementation of the program “Assistance of Capacity Building in the Region to Address International Fish-Trade Related Issues” under the ASEAN-SEAFDEC Strategic Partnership mechanism. Since then, SEAFDEC has conducted a series of fora to facilitate regional discussions and development of common/coordinated positions among countries in the Southeast Asian region on the proposals to list certain aquatic species into the CITES Appendices. SEAFDEC has also been undertaking technical activities on the conservation and management as well as on the sustainable utilization of various aquatic species that could be proposed for listing in the Appendices, e.g. sharks and rays, seahorses, sea cucumbers, sea turtles and, catadromous eels. These activities aim to come up with data and information on the status and trends of the production and utilization of these species, as well as the existing conservation and management measures undertaken by countries in the region. The information compiled would serve as basis for discussions on the proposed listing of the species into the CITES Appendices. Furthermore, with funding support from the CITES-EU, SEAFDEC has been undertaking since 2016 the project that would support improvement of data collection specifically for recording of sharks and rays at species level, and also support capacity building in the development of Non-Detriment Findings (NDFs) for the conduct of scientific reviews that would justify as to whether or not trade endangers the species. Based on the FAO State of World Fisheries and Aquaculture 2018, the fraction of marine fish stocks fished within biologically sustainable levels has exhibited a decreasing trend, from 90.0 percent in 1974 to 66.9 percent in 2015. Nevertheless, throughout the past decades, governments around the world has provided billions, and by some accounts, tens of billions of dollars in subsidies to the fisheries sector. These include subsidies to capital and operating costs, which numerous analyses point to as having the potential to contribute to overcapacity and overfishing, and thus to unsustainable fishing practices. In order to ensure that subsidies would not contribute to overcapacity, overfishing and unsustainable practices, the World Trade Organization (WTO) launched in 2001 at the Doha Ministerial Conference the first of a series of negotiations on fisheries subsidies, with a mandate of “clarifying and improving” the existing WTO disciplines on fisheries subsidies. Since then, the WTO’s fisheries subsidies negotiations have had sustainability concerns as their core focus. Also integral to the negotiations are development concerns of developing and least-developed WTO members, given the critical role of the fisheries sectors of many such members. Thus, the need to balance sustainability and development considerations characterized the negotiations since the outset. During the Hong Kong Ministerial Conference in 2005, the mandate of WTO was enhanced to include the call for prohibiting certain forms of fisheries subsidies that contribute to overcapacity and overfishing. While the WTO negotiations on fisheries subsidies had been particularly active during the period 2005-2011, these entered a hiatus until late 2016, when a series of new proposals from the members began to be submitted with the aim of achieving binding outcomes at the Ministerial Conference in 2017. In 2017, at the Buenos Aires Ministerial Conference (MC11), it was agreed that discussions on fisheries subsidies should be continued, and that in order to achieve the Target 6 of the SDG14 “by 2020, prohibit certain forms of fisheries subsidies which contribute to overcapacity and overfishing, and eliminate subsidies that contribute to IUU fishing, and refrain from introducing new such subsidies, recognizing that appropriate and effective special and differential treatment for developing and least developed countries should be an integral part of the WTO fisheries subsidies negotiation,” the discussions on fishery subsidies should be concluded by 2019. The proponents, spanning diverse groups of members – developed, developing and least-developed, all focused, among other things, on prohibiting subsidies that contribute to illegal, unreported and unregulated (IUU) fishing, and most of the members also sought to prohibit subsidies in respect of the overfished stocks. Some also sought to address capacity- or effort-enhancing subsidies. However, the approaches to these proposed prohibitions varied too much for substantive outcomes to be agreed at MC11. In November 2018, the WTO Negotiation Group on Rules came up with TN/RL/W/274/Rev.6: Working Document on Fisheries Subsidies, which represents a unified version of the Negotiating Group’s working documents on fisheries subsidies produced to date. The purpose of this document is to facilitate further work of the Group. SEAFDEC also provides the platform for the Southeast Asian countries to discuss and come up with harmonized approaches toward the issue on fisheries subsidies. For example, the Regional Technical Consultation (RTC) on International Fisheries-related Issues on 20-22 June 2018 in Bangkok, Thailand, included discussions on fisheries subsidies. During the 2018 RTC, it was agreed that the scope of fisheries subsidy should focus on the types of fishing gear and not by species, and that fisheries subsidies should not be considered as standalone issue, as it has close linkage with other initiatives e.g. sustainability of the fish stocks. In order that the discussions would also address the issues that concern the region, it was agreed that the ASEAN Member States (AMSs) should consider the possibility of sending delegates that comprise especially their national fisheries officers, to attend in different clusters of fishery subsidies negotiations. Meanwhile, SEAFDEC should also facilitate the identification of the focal point of each AMS as well as the development of the ASEAN common position on fishery subsidies for adoption by the ASEAN Minister on Agriculture and Forestry (AMAF) to be reflected at the WTO fora upon consideration by the SEAFDEC Council. The recent official statistics in 2016 indicated that 59.6 million people were engaged in the primary sector of capture fisheries and aquaculture. The statistics also indicated that 85% percent of these people was in Asia. The increasing demand of workers in the fisheries and relevant sectors to serve the expansion of intra-regional and international trade of countries in Southeast Asia, results not only in large numbers of migrant workers getting onboard to seek work opportunities in other countries but also large groups of workforce moving from one country to another. Issues and concerns in fisheries labor have arisen on allegations that the workers receive low wages, their social security is either non-existent or inadequate, they are unskilled in relation to fishing operations, received inadequate training before working onboard fishing vessels, not aware of the requirements for safety at sea, possess fake or no legal documents, subjected to forced labor, child labor, human trafficking, experience poor working conditions and unfair treatment by employers, and that some fishing vessels do not comply with sea safety requirements. Thus, the labor in fishing industry has recently become one of trade-related issues considering its possible linkage with human trafficking and forced labor in the fisheries sector. The U.S. State Department’s Office to Monitor and Combat Trafficking in Persons annually issues Report on the Trafficking in Persons or the TIP Report, which divides nations into tiers based on their compliance with the standards outlined in the Trafficking Victims Protection Act (TVPA). The inability of countries to resolve the labor issue including human trafficking could result in sanctions on importation of seafood from such countries to major markets, e.g. the European Union and the United States, in the future. To provide a global framework for providing fishers and fishing crews decent working conditions onboard fishing vessels, the Work in Fishing Convention (C188) was adopted during the 96th International Labour Conference of the International Labour Organization (ILO) in 2007, and came into force on 16 November 2017. Targeting all fishers and fishing vessels engaged in commercial fishing operations, C188 established the minimum requirements for work on board, conditions of service, accommodation and food, occupational safety and health protection, medical care, and social security. Although C188 is applicable to fishing vessels measuring 24 meters in length and over, the provisions stated in the Convention could also be applied to vessels between 15 and 24 meters in length if a country’s competent authority determines that these are reasonable and practicable. For the Southeast Asian region, although fishing vessels are generally smaller than 24 meters in length, and the C188 is not compulsory for those countries that are yet to ratify it, the national laws of several countries have already been adjusted to accommodate some relevant provisions in C188, such as the minimum age of fishers, fisher’s work agreement, number of hours of work, and so on. • Philippines: Vessel owners and skippers are required to provide a guarantee that all crew members are to be treated in accordance with Philippine labor laws, before a fishing license is issued for a vessel. • Indonesia: A special Sub Directorate of Fisheries Labour and Manning a Fishing Vessel was established within the Directorate of Fishing Vessel and Fishing Gears under the Directorate General of Capture Fisheries of the Ministry of Marine Affairs and Fisheries, to deal with issues related to labor in the fisheries sector of the country. • Thailand: The Royal Ordinance on Fisheries of 2015 includes labor aspects (Article 11), and the Department of Fisheries (DOF) in cooperation with the Department of Labour Protection and Welfare (DLPW) and the International Labour Organization (ILO) had developed a set of four Good Labour Practice (GLP) Guidelines which is still pending the endorsement by the Government of Thailand. • Promotion of safety at sea in small fishing vessels. A series of training courses have been conducted in the SEAFDEC Member Countries to promote safety at sea in small fishing vessels. The publication of FAO/ILO/IMO on “Safety Recommendations for Decked Fishing Vessels of Less Than 12 Metres in Length and Undecked Fishing Vessels” was translated into various national languages and promoted in Cambodia, Indonesia, Malaysia, Myanmar, Philippines, Thailand and Viet Nam. • In 2016, SEAFDEC organized a Regional Technical Consultation on Labor Issues. Discussion was made on the need to strengthen the roles and obligations of the “Receiving State” and the “Sending State,” and that the establishment and implementation of Memorandum of Understanding (MoU) between countries should be promoted. Moreover, receiving countries should consider developing standard employment contracts and other protection measures, and support the workers through the conduct of specific pre-departure training programs (occupation, language, culture), especially those who intend to work in the fisheries sector while sending countries should provide specific pre-departure training program (occupation, language, culture) for workers who intend to seek employment in the fisheries sector based on the MoU. • Development of a demonstration boat using the SEAFDEC research vessel “M.V. PLALUNG” with LOA (Length Overall) of 17.5 meters and capacity of 35 GT (Gross tonnage) that complies with C188. The modification includes replacing the existing superstructures to accommodate additional navigation equipment, communication equipment, and enhance the service area (e.g. the galley, sleeping quarter for individual crew members, mess room, and toilet). In addition, the net drum for trawl net operation was installed at the stern deck behind the superstructure to facilitate retrieving of trawl net with the minimal number of fishing crew. • Modernization of commercial purse seine vessel in Pattani Province, Thailand, by making use of hydraulic equipment. It is expected that the use of hydraulic equipment for hauling of purse seine net could reduce approximately 50% of labor. Nevertheless, this activity is on-going and it is expected that the modernization of such a vessel would be completed by December 2018, while launching for its actual operations is scheduled in January 2019. The Fishery Statistical Bulletin of Southeast Asia of SEAFDEC has a compilation of producer prices of species from capture fisheries production as shown in the tables below. The producer prices of selected species indicate that the prices could differ among countries due to several factors such as supply and demand, production cost, as well as alternative commodities. Note: The above tables include only the selected species and producer prices that were reported by more than one country. For other species, the producer prices could be found in the Fishery Statistical Bulletin of Southeast Asia published annually by SEAFDEC. This final action implements the import provisions of the Marine Mammal Protection Act (MMPA). This rule establishes conditions for evaluating a harvesting nation’s regulatory program to address incidental and measures to address intentional mortality and serious injury of marine mammals in fisheries that export fish and fish products to the United States. Under this rule, fish and fish products from fisheries identified by the Assistant Administrator in the List of Foreign Fisheries can only be imported into the United States if the harvesting nation has applied for and received a comparability finding from NMFS. The rule establishes procedures that a harvesting nation must follow and conditions to meet, to receive a comparability finding for a fishery. The rule also establishes provisions for intermediary nations to ensure that intermediary nations do not import, and re-export to the United States, fish or fish products subject to an import prohibition. The Seafood Import Monitoring Program (SIMP) establishes for imports of certain seafood products, the reporting and recordkeeping requirements needed to prevent illegal, unreported and unregulated (IUU)-caught and/or misrepresented seafood from entering U.S. commerce, providing additional protections for the U.S. national economy, global food security and the sustainability of our shared ocean resources. The European Commission’s Directorate- General for Health and Food Safety establishes import conditions for shery products and shell sh (bivalve molluscs). By following these rules non-EU countries can guarantee that their exports of such products fulfil the same high standards as products from the EU Member States – not only with respect to hygiene and consumer safety but, if relevant, also to their animal health status. The EC Regulation 1005/2008 sets out a European Community system to prevent, deter and eliminate IUU fishing. This system applies to all IUU fishing and associated activities carried out within the territory of Member States, within European Community waters, within maritime waters under the jurisdiction or sovereignty of third countries and on the high seas. These provisions include rules on inspections of third country fishing vessels in European Community member States ports, a catch certification scheme for importation and exportation of fishery products, as well as provisions on identification of fishing vessels engaged in IUU fishing. The European Commission works to ensure that Europe’s food supply is the safest in the world and that the same standards of food safety apply to all products regardless of origin. As the world’s biggest importer and exporter of foodstuffs, the European Union works closely with international organisations and offers advice as well as assistance to non-EU country trading partners.